As mentioned on meta.stackexchange.com several months ago, all network sites will be getting updated themes. Unix & Linux is one of the first sites that will be updated. As such, I'm posting the design here so you can see how the new theming will be applied to your site. I really dislike having the space on the left-hand side of the page being used up (wasted) for a few navigation links. I usually have my window manager configured so that my web browser uses half the screen size, horizontally. With the current SE theme, this mostly works well (other than working through the review queues). 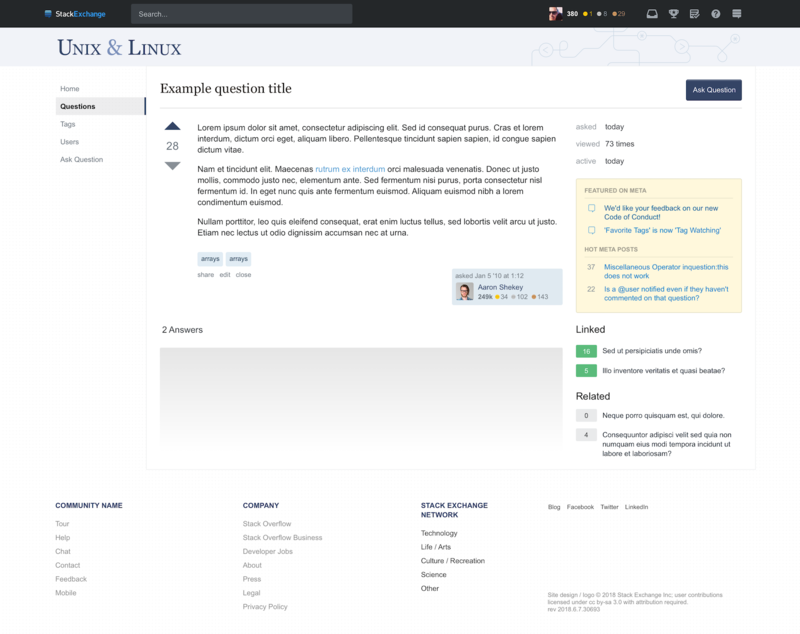 On Stack Overflow, there is a Hide left navigation setting in the site preferences which works well for maximising screen real estate for displaying the Questions and Answers. I hope (and presume) that this setting will become available to users of Unix & Linux when this site has its theme updated. Thanks for the update and enjoy the vacation. Is it possible to include the feedback from Icons of the badge counts and change the icons to represent UNIX & Linux more clearly, as opposed to the barely-visible ~ symbol there now? example here. I also second Pandya's suggestion to keep the forward-slash in the tag names. I'd also mention Is it possible to have the <kbd> for the comma enlarged? as another design feature-request that's not completed. It looks like "/ask question" in the site header should be changed to "/ ask question" will be invalidated with the movement of the top bar to the sidebar. Could we re-instantiate the forward-slashes to the fronts of the side-bar names? Also: Error image nominations from 7 years ago -- any possibility of including them? Also (unclear from the given screenshot): Is expected that header elements use different fonts? ... which seems (to me) to rule out ... just about everything from the initial list, unless I'm still misunderstanding something. 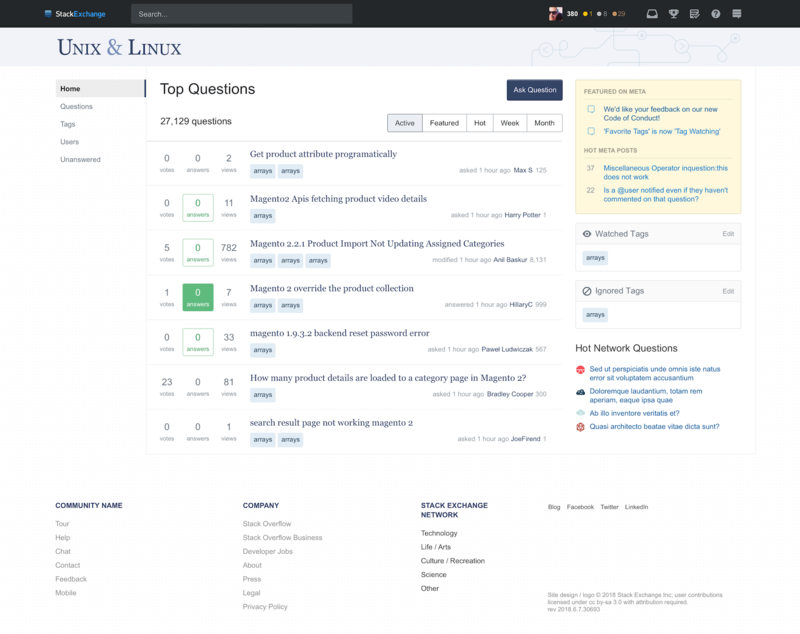 To me it looks like any other beta stack exchange site with a logo. I really liked the fact that this site was a bit different specially the centred title and the blue navigation bar. I do not mind the design change much, and the new one is fine. But the UI elements lost a bit of individuality (Upvote/Downvote buttons look normal instead of individual for the Unix/Linux Sta.X. network. ).